A classical wedding decoration conjures up traditional weddings and all the other paraphernalia that goes with such weddings. Fortunately the great big Indian wedding has only gone from strength to strength. Many couples opt for destination weddings so that their relatives and friends can participate in all the wedding functions and renew old ties. Relatives and friends are spread across the world today and being invited for just one day or one wedding occasion does not seem worth the long global travelling to attend, hence the need for classical weddings at one destination, turning the wedding into a fun and festive, forever to remember occasion along with the sacred and solemn occasion. The massive stage for the reception and the mandap are the two main and outstanding wedding decorations that can be considered classical. Even though today many couples, do move around amongst the guests and do not just stand on the stage, the couple does go back on the stage for those guests who have yet to meet and greet. The visual of the stage decorations are the lasting impressions of a wedding. The backdrop of a stage is very important for the photography too, the photographs remain in perpetuity, and hence the flowers in the immediate backdrop are extremely necessary. Spring Blossoms has curated some absolutely stunning classical decorations and themes for you. These can inspire you to creatively use the ideas you see within your budgets and maybe add another twist to the decorations with your own imagination. Red and White is one of the most stunning stages for a wedding reception. The blend of small crystal combined with white and red fresh flowers and large plaster of paris flower pillars and very contemporary lighting. All the elements, the crystals, the contemporary lighting, the contrast colour of the flowers can be used with other colours and elements too. Elegance is the first impression of this classic decoration. 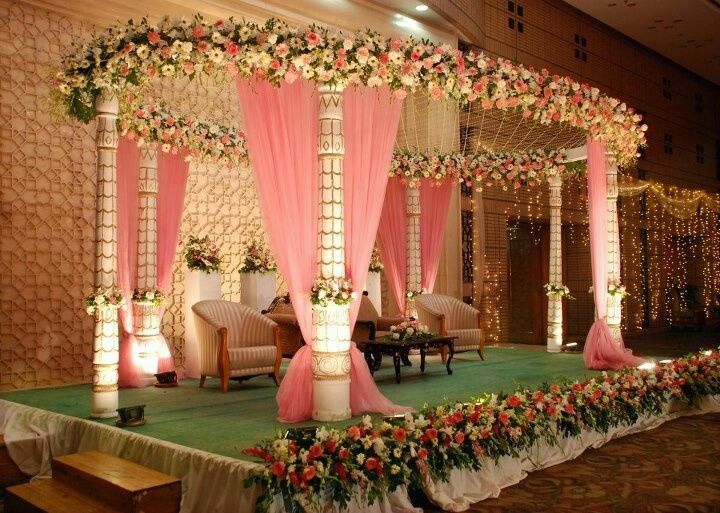 The stage itself has a mandap theme and can be used for a mandap too. The colours are soft with pink and white, this is a ladies’ colour through and through, it is surprising to know that most bride grooms are always willing to let their brides’ have a say for the flowers and colour theme. This would be a fairly cost effective yet classic decoration for your wedding. The colour scheme can always be changed in case the couple like a myriad colours theme or a bright orange and yellow one, especially if the theme is used outside. This stage can be set for both outdoors as well as indoors. Grand White is also a much loved theme, especially for Indian wedding abroad. Many indian couple abroad have changed their style and tastes as per the country they live in and this theme suits their tats and is at same time classic Indian in its opulence. The very innovative lighting combines with the splash of white that this theme makes. 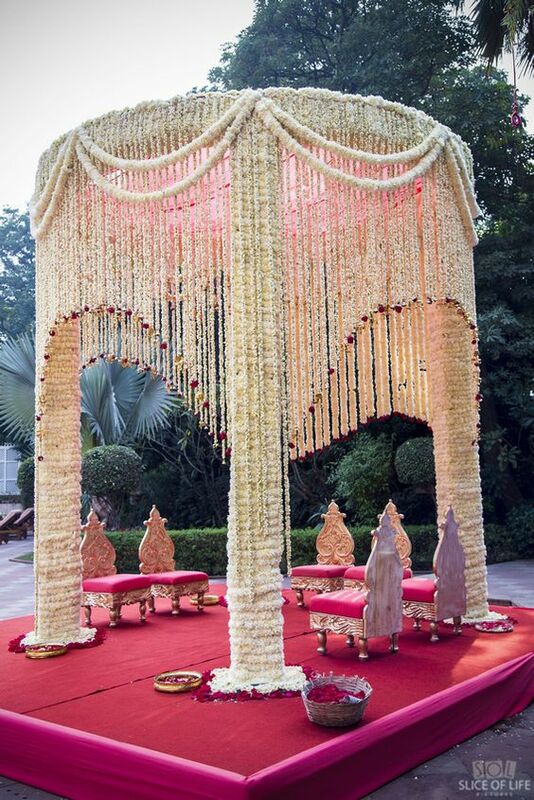 To bring down the cost if you want to use this kind of a theme in India when its a hot summer wedding, one could use jasmine or tuber roses strings or garlands. The pasting of flowers on the steps and all around can be made with “shevanti” the Indian chrysanthemum available by the kilos and make the theme cost effective. 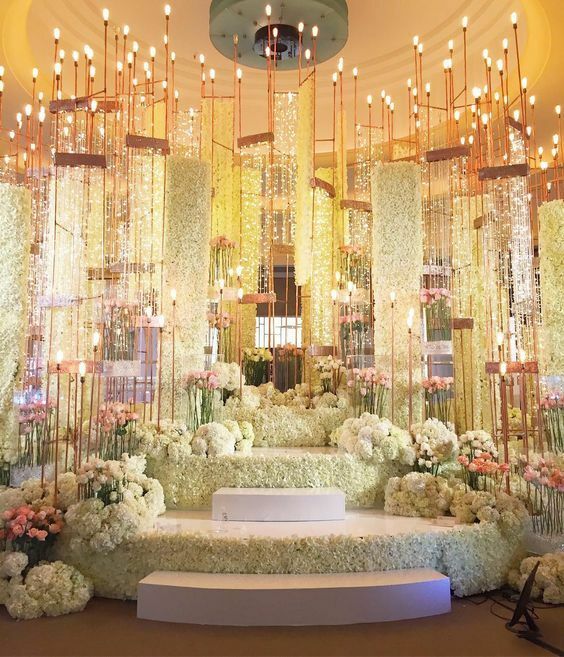 Instead of using large white hydrangea balls of fresh white roses or carnation can be used to create the same effect. This is a mandap theme, and could not be more classical than having Ganesh ji bless the couple. A simple pasting board with white shevanti flowers has been created while the floral artist drew Ganesh ji with gorgeous Indian red roses, again pasted on a sketch that is pre drawn, the fragrance of this mandap will be quite a nice roses fragrance. Another wonderful summer mandap theme with shevanti and simple classic tones. The heat of our May weddings deserve this white which makes us feel cool as the wedding takes place under the white mandap. Colours can be added with the cloth draping too. If one wants the fragrance of flowers, you can use tuberose garlands, the effect will be exactly the same as looks are, but there will be a delightful sweet fragrance pervading the venue. Nothing can be more stunning than this very very classic red roses decoration. This is a winter wedding decor when the mandap is open to sky, the weather is chilly, so the red hot roses look even more stunning. Besides, the red roses are much more luscious in the Indian winter, of the plains. Along with the red roses, one can use bright red African daisies, the brighter red, definitely make this mandap decoration stand out more. The green foliage is used very sparingly as there is much natural greenery around too. There is also a correct use of red carnations, so that a droop of red is also added. 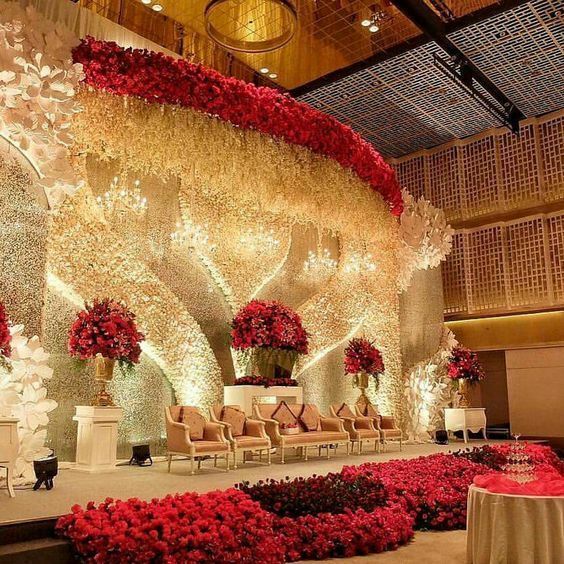 This is a classic yet not very easy to make wedding decoration, all flowers and foliage have to be balanced well and the different hues of red have to be complementing to each other. With all these lovely wedding ideas, one can turn ones wedding into a lifetime event that is captured forever in the beautiful memories and photographs. Weddings are once in a lifetime event for us and hence no research should be spared for bring out the best theme and decorations that suit our personalities and also our budget. With the social media sharing available today it is very easily possible and one can borrow ideas from across countries and blend these decor ideas with our own traditional ideas too. Laxmi Lobo is a Singapore trained floral designer. She is now a retail florist in Mumbai and specialises in flower delivery in Mumbai. Her online bouquet delivery in Mumbai has won accolades from the press and has interviewed on TV for CNBC & ET NOW. Visit Spring Blossoms to know more about Flower Delivery In Mumbai.